When Paramount were looking for a brand new concept for delivering blockbuster movie content to consumers, they came knocking on our door. They needed something totally new. So new in fact, it was as though it was from the future. Or perhaps from outer space. After all, they were looking for new, innovative ways to deliver two of the most eagerly awaited, action-packed franchise movies of the year – Star Trek and Transformers. DVD format was waning. Internet was growing to a perfect storm for content delivery and satisfying consumer needs. Computers were changing (USB ports becoming more popular than Disc drives) and a new generation of consumers and tech-savvy buyers had emerged. The brief was an interesting and challenging one and there were very tight parameters around delivery dates, budgets, compatibility, formats, digital rights management and of course, quality. With creative thinking caps firmly on, we designed first-of-their-kind custom molded USBs. The Star Trek USB was beautifully crafted out of a premium quality zinc alloy, in a shape that any Trekkie would be familiar with; the iconic Star Trek insignia. 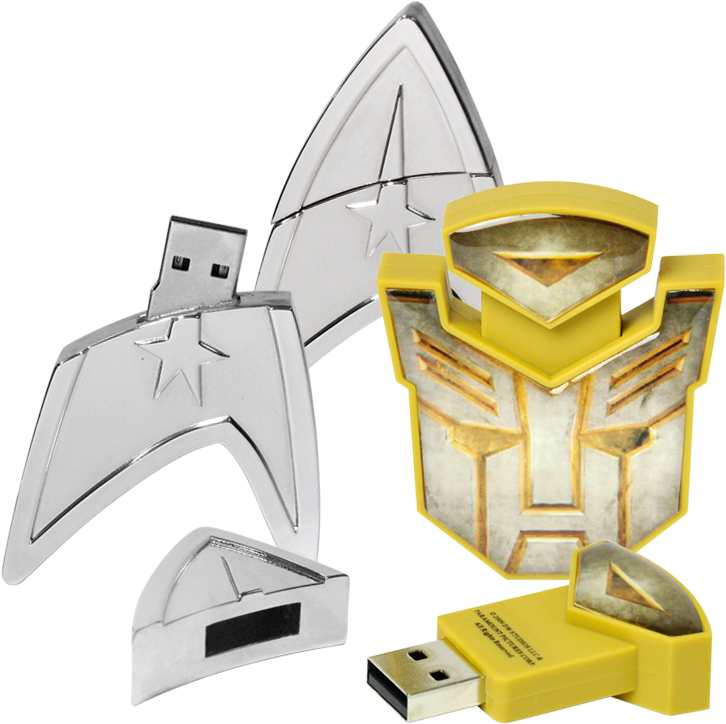 The Transformers USB was created using an injection molded ABS plastic, with a high quality printed epoxy dome resin facia. Both contained the movies protected by the leading digital rights solution provider DivX. The USBs were packaged in custom designed tin-plate packs that were embossed and printed and contained with a clear window aperture so you can see the USBs within. Inside, along with the user instructions, was a USB cable and a mock chip with the DivX activation code. The tins were Litho printed and each individual tin was laser etched with a sequential ‘limited edition’ number to create a huge air of out-of-this-world desire. The product was wrapped in a snug fitting sleeve that was full colour printed on a high-quality clear plastic. 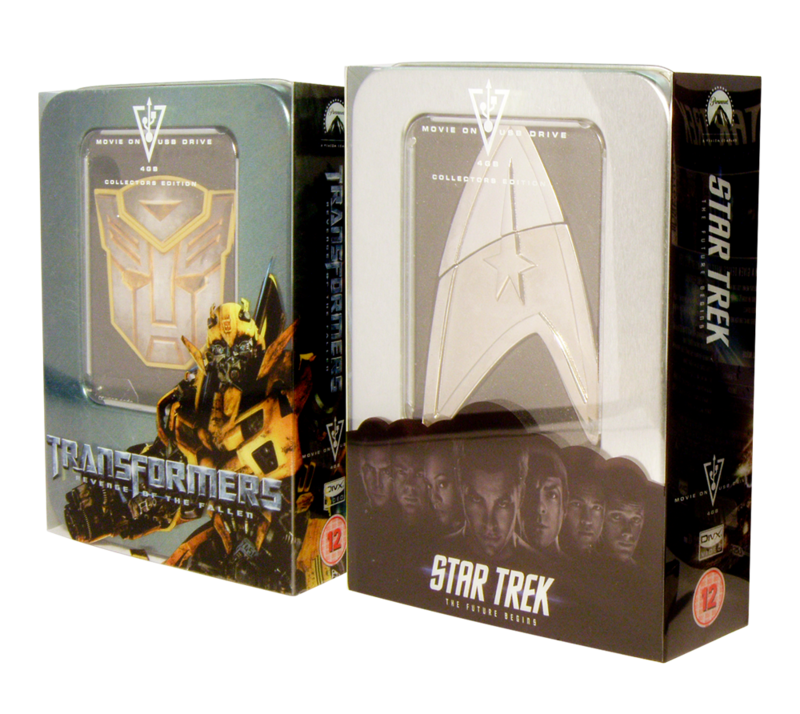 The end result was a new age, space age, special collector’s edition product format that was absolutely cutting edge.